The 11 sons of Jacob hated their younger brother Joseph. One day, Jacob sends Joseph to his brothers who are out in the fields shepherding the flocks. Joseph is wandering out in the desert. He is lost. An unnamed man comes to Joseph, “And the man asked him, “What are you seeking?” 16 “I am seeking my brothers,” he said.” The man tells him where they are and a long story made too short: Joseph’s 11 brothers sold him into slavery and lied to their father Jacob that a wild animal killed Joseph. One of the rabbis centuries ago said that the word “man” in Genesis 37 is repeated three times, that this man must have been, like the three angels at the Oaks of Mamre, an angel of the Lord. Maybe it was Christ Himself. We don’t know because the Lord does not tell us. Yet, Christ is looking for His brothers. The Father looks and seeks for his sons, both of them. Jesus’ parables is also about brothers who do not seek each other and who should be. When Jacob is told that Joseph is dead, Jacob tore his clothes exposing himself in his father’s undying love for his son who was dead and lost to him. The Father goes running to his son while still far off when his dead son was coming home. The father…what was he thinking about? His younger son asks for his inheritance. When does a person receive an inheritance from, say, a parent? His younger son is telling Dad in effect: you are dead to me, give me what I deserve. The shame. In a town, the word of this would get out quickly. What happened to your younger son? Probably a question attended by rumors: did you hear…? Then the father, without batting an eye, divides up his whole living between his two sons. He does not say No here at all. No, “talking to”. But gives it all to them. Just like that. What was he thinking about? Like the rabbi and a synagogue member were walking and they came upon a man begging, and the rabbi gave him some money. Down the street, the man asked his rabbi, Don’t you know what kind of man that is you gave him money? The rabbi answered, The Lord gave it me didn’t He? The Lord gives to us all just like that. Their extended family and the town would be talking about this and asking as well, What’s this Father thinking about? He gives to me, to all knowing our character. The Father had every right in that time to exact even corporal punishment on his younger son for bringing such shame to their Father. This is unlike any father I know about to give all to his sons, probably knowing their character already. This is unlike any father…on earth? He risks his love publicly on his sons. In a far country, the prodigal son met with pigs, pods and punishment. After awhile he spent his inheritance, his Father’s living, in a reckless, luxurious ‘life’. He thought he would have life apart from his Father. A famine came upon that land and famines do not happen overnight. Night after night, the Father might have prayed for his youngest son. Then with no money, and no food, he hired himself out to a local pig farmer. By the fact this land had pig herds, this was not Israel, nor was it a Jewish region. After awhile, he longed to eat the pig’s food, probably, carob pods, even the pods, but no one gave him anything and his Father all the son’s live gave him everything he needed to live. Pigs and pods were punishment for him until he realized he could eat at home. It was utter and abject necessity that drove him home, not a sense of sin, after all, no one was there to preach and teach God’s Word, of Law, to show him his sin. He has no contrition or sorrow over sin. His speech did not acknowledge his sin.His stomach laid heavy on him not his sin, he did not acknowledged it, Father, I sinned, I should never have asked for my inheritance the way I did. None of that. His He wants a job at home, at least. so he can eat. He prepares mentally his speech as someone who has been caught deeply in his own wrong. He was dealing not repenting. In the 23rd Psalm, the 3rd verse He restores my soul. We are told the younger son comes to himself. The prodigal acts to return to himself. David knows by faith, and prays God acts to return David to God. He leads me… The son’s confession lacks even an ounce of remorse. No I’m sorry. He has no contrition or sorrow over sin. He wants a job at home, at least. so he can eat. He prepares mentally his speech as someone who has been caught deeply in his own wrong. He was going the wrong way. He got his body going the right way but his soul was going the wrong way. And in spite of himself, the Lord was leading him home. “Oh, wondrous thought! You found me when I sought You not!” So when still far off, the Father comes running to him. Hiking up his robes…and the younger son doesn’t have a chance for his well-rehearsed speech for before… The son is still in the far country and the father comes running to him, quite publicly through the streets for all to see a man of honor, fame and wealth, acting so without dignity. His mercy on display for all see. The Father’s love and mercy for all to see in the indignity of His Son dying on the cross for sinners. 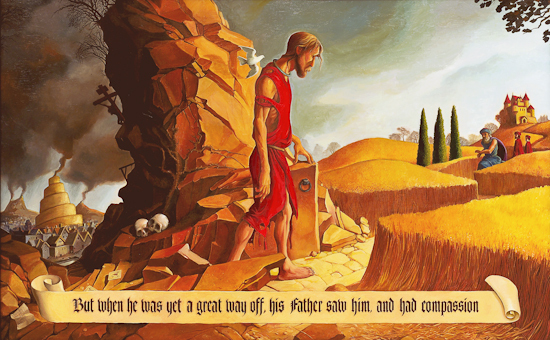 But while he was still a long way off, his father saw him and felt compassion, and ran and embraced him and kissed him. Then the younger son begins his speech and before he can finish it, the father tells his servants, ‘Bring quickly the best robe, and put it on him, and put a ring on his hand, and shoes on his feet. The son while “still a long way off”, did the servants come with him? Yes! The Father and his house comes to him to cloth the younger son in a way he did not deserve at all! Clothed in a righteousness not his own! Now the Father was probably not an old man and had many years ahead. Also note, the older son does not protest at the beginning: Oh, Father, I will be so sad when you lay with your fathers, I don’t want my inheritance, you are not dead to me. When the younger son comes home, once again the Father leaves the party because the elder son refuses to go in. What a snot. A fattened calf would have been enough to feed at least 200 people! The master of the house goes out, as host, of his own party of joy, to his elder son. The shame! The elder son says he always obeyed his Father, I never disobeyed you, I slaved for you all these years, yet here’s the rub: he has the inheritance, he’s in his Father’s house and anything he has done has only improved his own financial status! The Father would give his inheritance to a slave?! It is clear the Father never wanted the service of a slave, but only of his son. Son, you are always with me, the elder son was also clothed in the love and mercy of his Father, righteousness not his own, an alien righteousness of sheer grace, gift. And the Father says, but we had to DEI, as DEI as Jesus must suffer and die, the Father wanted to rejoice, he did not give that party for the son, but for the joy of his return. The elder son is lost while at home. Can a person actually be lost while at home, in his father’s house? Joseph’s brothers were in slavery as well,to their envy and jealousy, their greed and lust while in their Father Jacob’s house. Unlike Joseph, the elder son does not seek his brother. Both brothers were lost in their Father’s house and the Father went out to them as lost as the one sheep in the wilderness, as lost as the woman’s silver coin in her own house, far off and near by. The elder son said, “this son of yours” and the Father gently yet powerfully says to him, “this brother of yours”. The Father was seeking his sons, the brothers. All of Luke 15, a long chapter is Jesus answering the one accusation, He eats with sinners and tax collectors: He wants joy, finding the lost, the dead alive in Him. He comes from a long way off to this far country and under His own nose to find the lost. He has to celebrate, more joy in heaven over one sinner who repents than 99 who don’t. They think they have kept all the commandments perfectly! See the elder son! He wants reconciliation and His Church is the only land of reconciliation in a world of irreconciliable differences. He has publicly made known His mercy to sinners for all to see the salvation of our God: the Christ upon the Cross. We do not deserve the Lord’s inheritance, but the Lord alone knows fully we need His inheritance. According to the promise, that is what Christ Jesus has done baptizing you, making you own, forgiving you, finding you when lost, sealing you with the Holy Spirit by, through, with, and under His death and resurrection.